After two days without electricity thanks to the Blizzard of 2016, I am very appreciative to have power restored. I ventured outside and snapped this photo of Mini Pearl Bracelets in the snow. Designed by Lizzy House, my bundle of Mini Pearl Bracelets contains 16 colors, but the entire 33 piece collection can be seen at Andover Fabrics. Until I have a project in mind, I could not bear breaking open the bundle. 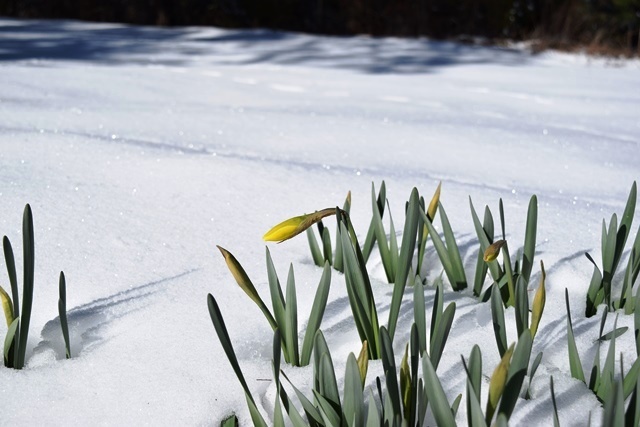 The daffodils are already budding and are pretty against the blanket of white. We had around 4 inches of snow, but now is all melting away. Since I am crushing on my bundle of Mini Pearl Bracelets, I am linking to Beth at Cooking Up Quilts with Main Crush Monday. They do look pretty out there in the snow! That's a long time in the cold without power. Love your photo and hope your daffodils are ok. I'm surprised yours are ready to bloom; mine are just putting up some green. Your photos look so great. The snow is a great back drop and I am amazed at the daffodils! I'm glad you have your power back. What a lovely setting for picture taking - especially of such colorful fabrics. I've seen those prints around a while but haven't added any to my fabric collection yet. I hope you find the perfect project for them soon! I'm happy your power has been restored. I love those prints, they look so great all wrapped up and tied together. Glad you got your power back on! Great setting for the mini pearls. Wow, daffodils this early? You must live farther south than me! No power and snow does not make a happy quilter! 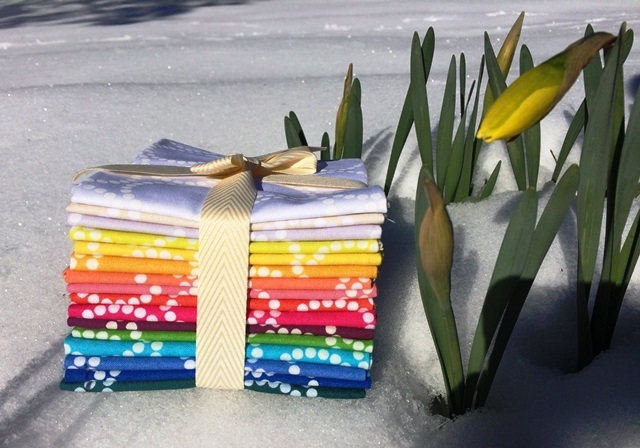 There's something about quilts on snow!! Daffodils?!! Where in North America ARE you??!! Oh my goodness the daffodils are so pretty against the snow! And the pearls!! Do you have a quilt in mind? or just crushing? Glad your power is back - that's the part I hate about snow storms!! Whew! Glad your power has been restored. What a crazy storm! Two days without electricity is not fun, glad you've got it back. Those mini pearl bracelet colors are beautiful. The snow is the perfect backdrop. We had 4 days without electricity right before Christmas a couple years ago...it was awful...we are very used to having power, aren't we? I bought a hand crank sewing machine last year so I could use it in such cases, lol!! I need to stash away some of those mini pearls, they look great in the snow!